The importance of the vielle in mid to late medieval European culture is clear from surviving historical artefacts, paintings and manuscripts. From the 12th century on, the vielle was associated in literature with both amateur and professional players (along with the citole and harp), as an instrument to play dance music; to accompany others’ secular songs; to self-accompany secular singing; and, perhaps surprisingly, as an accompaniment to religious song. The vielle found favour in royal and noble households. 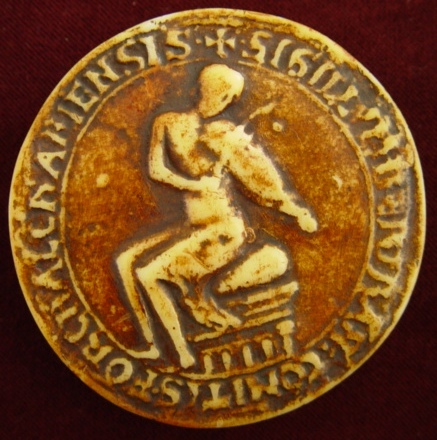 The seal of Bertan II, Count of Forcalquier, France, dated 1168, has him armed with a sword and shield on horseback on one side, and sat playing a vielle on the other; King Ottokar II of Bohemia, writing in the early 13th century, gave the names of 17 fiddlers at King Manfred of Sicily’s court, implying that there were many others; and Duchess Isabella, wife of Duke Philip the Good in 15th century Burgundy, employed two blind Portuguese lutenists who also played vielle and other “soft”, i.e. indoor, instruments. The medieval fiddle is a regular element in decorated manuscripts and paintings of the period, and features in religious paintings played by angels or humans in attendance of the holy, sometimes on its own, often among other instruments. Minstrels, servant musicians in the employ of wealthy households, used the fiddle to accompany others’ singing; and jongleurs, French musician-poets who performed both in the service of the wealthy and freelance, used it to accompany dancing and their own singing of chansons de geste, songs of heroic deeds, a popular genre in the 12th and 13th centuries. The troubadours, French Provençal lyric poets and singers of the 11th to 13th centuries, now have the reputation of having the vielle as their favoured instrument, as do the trouvères, the epic poets and singers of northern France in the 11th to 14th centuries. This idea seems to have arisen from two 13th century manuscript depictions of the troubadour Perdigon playing the fiddle, and from an account of the French trouvère, Blondel de Nesle, searching for Richard the Lionheart, King Richard I of England. The mid-13th century Récits d’un Ménestrel de Reims (Stories of the Minstrel of Reims), relates that Blondel wandered for a year through strange lands in search of Richard, his captive master. Arriving at the castle of the Duke of Austria, Blondel heard the King, high in the tower, singing an unspecified song only the two of them knew. Blondel returned to the room in which he was staying and played the vielle with joy. He left for England to tell the story so that emissaries could bargain for Richard’s freedom. It has been repeated in many accounts since. For our purpose, the key feature is the inclusion of a vielle. This does not tell us, however, how other troubadours and trouvères accompanied their songs, or indeed if they did. Perdigon or Perdigo the troubadour (fl. 1190–1220), depicted playing vielle, left in BnF 854, f. 49, 13th century, right in BnF 12473, f. 36, second half of the 13th century. Angel in green with vielle from the Immaculate Conception Altarpiece, once in San Francesco Grande, Milan, painted by an associate of Leonardo da Vinci and Giovanni Ambrogio de Predis, possibly Francesco Napoletano, 1490–99. This vielle has the characteristic low, flat bridge, and 1 of its 5 strings is off the fingerboard as a bourdon. The consensus of the many available vielle images demonstrate a range of distinctive structural features that distinguish it from any modern bowed instrument. The first is the option, on a 5 string vielle only, of a bourdon. Harps and psalteries had bourdons, too. In their case, it was a low pitched string, sometimes pitched several steps below the next string in the sequence, that acted as a drone string. In the case of the vielle, it was a low-pitched string placed off the fingerboard and attached to the side of the pegbox by passing through a hole, so it could only be played open. As we see from the angle at which the bourdon leaves the bridge to reach the pegbox on the angel in green painting on the right, this made it possible to play the bourdon by plucking with the left thumb. Dominican friar and music theorist, Jerome of Moravia, writing in c. 1280, made it clear that the bourdon could also be bowed. The second and third features are a variety of body shapes, some very wide, and a variety of bridges. The bridge height was either less than its width or equal to its width (unlike on a violin), making for a low action (the relative height of the strings to the instrument). The iconography suggests most strongly that the bridge was often flat, unlike the marked arc of a violin bridge, severely limiting the angle at which strings can be bowed and positively necessitating drone playing on most or all strings at once. Of course, even on a completely flat bridge, string slots in the bridge could be made of various depths to create the string arc violinists are used to, enabling single string playing; but the iconography and the logic of the tuning system (see below) do not suggest this. Above we see illustrations of the three types of bridge on a vielle. In all these cases, there is a separate string-holder which has a particular effect on string pressure, creating downward tension on the soundboard, whereas a fixed and glued bridge without a string-holder creates an upward pressure on the soundboard. On the left, from Hans Memling, Angel Musicians, Antwerp, 1480s, we see a flat bridge and therefore strings of equal height. Often this would be a simple wooden block. In this case and in some other iconography, the block is castellated, possibly to allow tuning of individual strings. Luthier Chris Doddridge tells me that castellation also has a beneficial effect on string vibration and overall timbre. Castellated bridge or not, strings would generally have to bowed as a humming block. In the centre is a detail of a vielle from Sano di Pietro’s Madonna enthroned with baby, Siena, c. 1428. Here we see a bridge with a definite arc, probably not at an angle sufficient to easily allow the playing of single strings, but enough to bow adjacent courses without having to bow all strings at once. This vielle has a bourdon (which will be significant in a later discussion). On the right, in a detail from Sano di Pietro, Assumption of the Virgin, 1448-52, the strings are on a flat plane, tied onto the string holder which is supported by a post. Overall, historical images show us a range of sizes; a variety of shapes, most typically having a body shaped as an oblong box with rounded edges or with a gently curving waist; the neck was sometimes fretted with gut, more often unfretted; string numbers were usually 4 or 5, but sometimes 3 and possibly 6; it was played on the shoulder, or against the upper chest, or on the knee facing forward like the rebab or viola da gamba; and played with bows of various sizes, lengths and curvatures. Left: Two details from The Way of Salvation fresco in the Spanish Chapel, Florence, by Andrea di Bonaiuto, 1365. Here we see the low, flat bridge and the use of a bourdon on a 5 string vielle. The position of the thumb and bow suggests the bourdon here is plucked while the other strings are bowed. The illustration bottom right, from the Boethius manuscript, De Musica, 14th century, suggests this, too. Compare the shape and the low height of the vielle bridge from the green angel in the Immaculate Conception Altarpiece above and from The Way of Salvation fresco with that on the detail of the baroque violin, top right, from Orazio Gentileschi, Young Woman Playing a Violin, c. 1612. The low, flat vielle bridge would facilitate playing all the strings as one sonic block, not possible on the curved violin bridge, and would make the vielle much fuller-sounding but quieter than the violin. A variety of sizes, shapes, strings, and bourdon / fret choices (click picture to open in new window). Lincoln Cathedral, 13th century: 5 strings, no bourdon, fretless (though, in carvings, frets are often left undepicted on fretted instruments). Gloucester Cathedral, c. 1280: 3 strings, fingerboard not visible. From the Chapel of San Nicola in Tolentino, Italy, after 1305: 5 strings, bourdon, fretless. Manuscript in Austria, c. 1300–1350 (Universitätsbibliothek Graz 32, fol. 106v): 4 apparent strings but 6 pegs, no bourdon, fretted. There are occasional depictions of 6 string vielles. Does this image suggest 6 strings in 3 or 4 courses, or is this artistic license we shouldn’t take literally? Hans Memling, Antwerp, 1480s: 5 strings, no bourdon, fretted. Though the evidence tells us that least one troubadour and many jongleurs sang to their own vielle playing, and minstrels accompanied others singing with it, it’s rare to find a modern early music performer who fiddles and sings together. And, though historical fiddles most often had flat bridges, it’s extremely rare to find a modern early music performer playing with one. Dr. Linda Marie Zaerr is dedicated to historically accurate performance of medieval music and literature, and she does both. Click video to play (51 seconds long) – opens in new window. 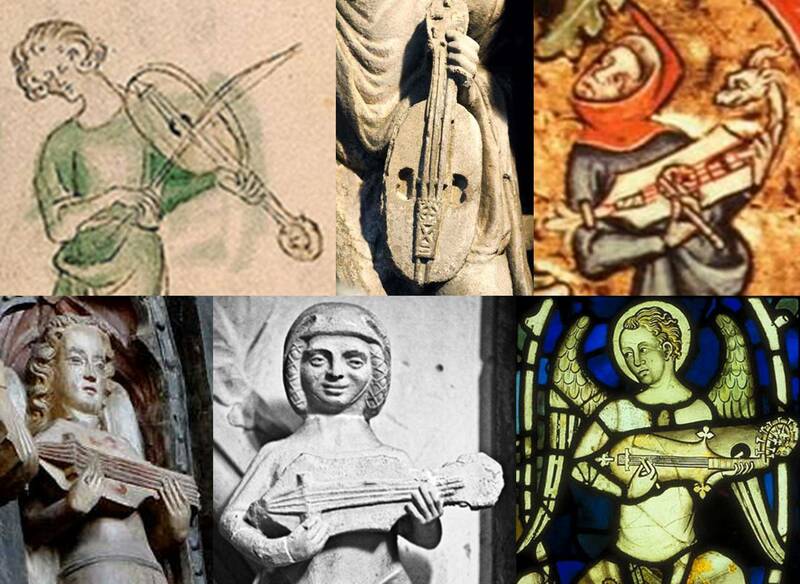 Ideally, we would have more than iconography to tell us about the medieval vielle: surviving instruments can yield information through measurements and x-rays that iconography can only hint at. There are three extant instruments that have been called fiddles by modern writers, but all is not always as it seems, and none can truly be called vielles. Part of the problem is in the medieval practice of naming an instrument, part is in distinguishing different but similar-looking instruments in iconography. In this article, my use of the term medieval fiddle refers specifically to the vielle and to no other instrument. Some modern writers about medieval instruments will sometimes use the generalised term fiddle to signify any bowed instrument, rather than the more specific terms vielle or rebec, for example. In doing so, such writers are, in a way, following the vagueness of collective medieval music commentators, who used the same word to mean several apparently unrelated instruments (more of which below), or used different words to denote the same instrument. Modern writers following suit doesn’t help us today in the task of categorisation in the service of understanding. Part of the problem with the distinction between vielle and rebec in particular is that in iconography they are not always easy to tell apart. I will use the Elblag “fidel” as a jumping off point to illustrate. The “fidel” excavated from Elblag / Elbing, Poland, in 1986-1989, dated to the 14th century. Is this a rebec, a vielle, or something else entirely? In 1986–1989, during excavations in Elblag / Elbing, Poland (it’s been in both Polish and German territory, and so has two names), several instruments were found in the latrine of a wealthy house: two bone pipes and a recorder from the 14th–16th century; a koboz dated 1350–1450 (misidentified as a gittern, the western European counterpart to the eastern koboz); and, from the same era, an instrument carved from a single piece of linden wood with a spruce soundboard, described by excavators as “a very small fidel”, measuring 33.3cm long. The lutherie of the instrument is extremely rough: the back of the asymmetrical body shows traces of hewing to carve the hollow bowl and the uneven back of the neck has what can only be described as hacking marks. It was not smoothed or polished. It must be significant that the area around Kowalska Street, where it was found, was inhabited by some of the poorer people of Elblag. The instrument, having been lost or thrown away in the latrine and found 5 or 6 centuries later, is damaged but otherwise well preserved. It is missing the lower part of body, part of the soundboard, the bridge, and the peg heads. It has 4 broken peg stumps and 4 grooves in the nut of roughly equal spacing for 4 strings. The excavators’ description, “similar to a baroque dance master violin”, likens it to a 17th century kit or pochette, similar in size and sometimes also the shape of the rebec design. So is this a rebec or a vielle? Before we arrive at that conclusion it is worth briefly exploring some iconography to explain why the distinction between vielle and rebec is not always easy to make. The first evidence of the word rebek is in an early 12th century table of Arabic and Latin terms (Paris, Bibliotheque Nationale, Ms. lat. 14754). However, there is no illustration. Bearing in mind the slippery problem of medieval instrument naming – several instruments with the same name, the same instrument with several names – we cannot be sure what rebek meant in this context, and the rebec as we know it does not appear with any certainty until the 14th century. All the evidence suggests that rebecs always had 3 strings, whereas vielles had 3, 4 or 5 strings. It follows that the two church elders carved on the Church of Sainte Pierre in Moissac, France, dating from 1115–1130, pictured above right, are holding/playing vielles. Though the shape is apparently that of the later rebec, the 5 tuning pegs (4 extant, 1 missing in both cases) indicates vielles. In the Catalan Psalter, c. 1050 (bottom left), 65 to 80 years before the Church of Sainte Pierre, we have the earliest apparent example of an identifiable European rebec, though such identification is almost certainly a mistake. A similar instrument (bottom right) is in the English manuscript, BL Arundel 91 (f. 218), a Passionale (Lives of the Saints) originating in Canterbury in the first quarter of the 12th century. Both are apparently single strung, as rebecs were. Though they look like rebecs, it is most likely that they are both vielles: the backs are not visible to see if they have the rounded back of the rebec or the flat back of the vielle, and there is no corroborating evidence for rebecs at this point in time. Both are in one of the vielle shapes, which looks from the top view like a rebec. The instrument on the right has 4 strings, precluding it from being a rebec, but whether this is to be believed is a moot point, since it has 3 tuning pegs. The point about the piriform or pear shape of the soundboard alone not identifying a true rebec is made clearer by two features: rebecs had round backs, vielles flat backs (making identification more difficult when we have 3 strings and only a top view); and the rebec did not employ a bourdon, whereas vielles often did. The first three illustrations below show 5 string vielles with bourdons; the last, if it is to be taken literally, shows 3 strings plus a bourdon (all other evidence shows that only 5 string vielles had bourdons, as we will see). All vielles are piriform, the shape later used for the rebec if seen only from the top. From left to right: a detail from an English psalter, first half of the 12th century (Bibliotheque Municipale, Lunel, France, MS. I, f. 6); a sculpture by Bennedeto Antelami, c. 1180, in the baptistry of Parma Cathedral, Italy; from the Lambertus Treatise, French, 13th century (King David with musicians on f. Av of Bibliotheque Nationale, Paris, MS. lat. 6755(2)); and a 13th or 14th century illustration added to a 10th century manuscript of De Musica by the Roman senator and philosopher, Boethius, originally written c. 510 (Biblioteca Ambrosiana, Milan, Italy, Cod. C. 128). Distinguishing with certainty between the rebec and vielle must therefore take into account several factors. Both instruments were carved from solid wood. 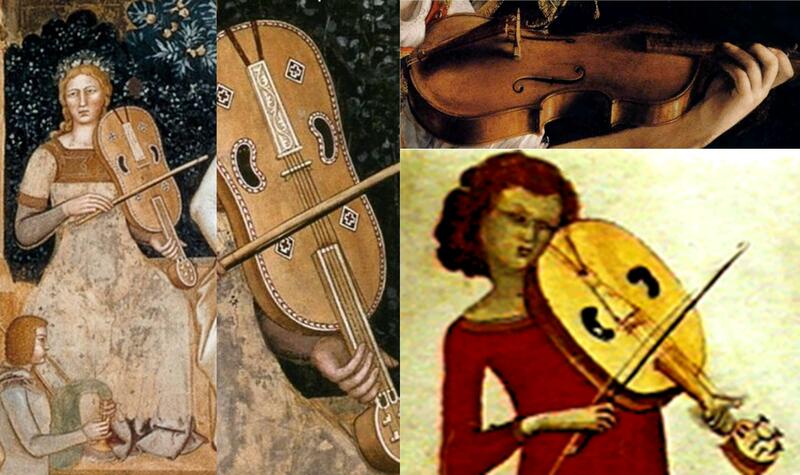 The vielle had a variety of flat-back body shapes and the rebec only one with a bowl back. The rebec had 3 strings and the vielle had between 3 and 5. The 5 string variety of fiddle often had a bourdon, the rebec never did. Vielles were sometimes fretted, often unfretted, and rebecs were always unfretted. This means that, in flat two-dimensional depictions where the back is not visible, it would be only the tuning – not visible in iconography – and the rebec’s arced bridge which distinguish it from the vielle, a distinction made even finer by the fact that some vielles also had an arced bridge and the bridge, in any case, is often not visible in depictions. Barry Pearce, who runs the online Bowed Strings Iconography Project, suggests tentatively that there may be one visible feature to distinguish a rebec from a vielle: that only rebecs had bent-back or crescent-shape pegboxes, whereas vielles had flat peg-holders, usually rounded, sometimes quadilateral. In his monumental survey of depictions of medieval bowed instruments in iconography, including three-dimensional cast metals, stonework, carved ivory, and wood, he found that only the rebab/rabab had a bowl back prior to 1300, and therefore piriform bowed instruments before 1300 are not rebecs. Christopher Page observes a further distinctive factor of instrument names built upon r-b – rubeba, rubeb, rubeba, rebecca, rebeccum, rebec: their small size. 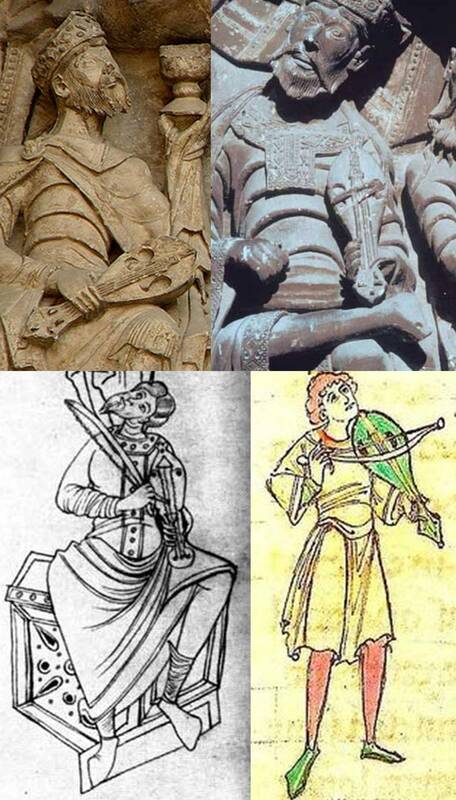 Jerome of Moravia in the 13th century, and Jean Charlier de Gerson and Johannes Tinctoris respectively in the 15th century, all describe the rebeba / rebecca / rebecum as small, or smaller than the vielle. Since small and large are relative terms and the vielle was made in a range of sizes, this distinction, though generally useful, is difficult to apply practically in some cases. Rebec or fiddle? First on the right are details from a late 15th century manuscript, Le livre des échecs amoureux moralisés (The book of chess lovers moralised), produced for Louise de Savoy (1476-1531), mother of King Francis I of France, now in the Bibliotheque Nationale, Paris. The mermaid’s instrument is shown with 3 lines for strings, clearly meant as 3 courses since there are 5 tuning pegs. This is a 3 course vielle with an arced bridge in the pear shape also associated with the rebec. The next two images were painted by Melozzo da Forlì in c. 1480 in the Basilica dei Santi Apostoli, Rome. First, an instrument with an arced bridge in the rebec shape, but with 4 strings and frets. Judging by the criteria established above, this is therefore either a 4 string vielle, unusual for its rebec-like bowl back, or a rebec, unusual for its vielle-like four strings and frets, or an example of an artist confusing the two, or an example of an unusual or experimental instrument. The next instrument from the same source is a clearly-depicted 4 string vielle with a flat bridge. Finally, the form of this 3 string vielle, a detail from the painting of baby Jesus’ bath in Köln Cathedral, Germany, 13th–15th century, is the shape and larger size we would ordinarily expect of a vielle in the early music revival, and the typical shape luthiers now use for their reproduction instruments. On this basis, the rebec is distinguished from the vielle of the same teardrop shape by having a combination of no frets, an arced bridge, a relatively small size, 3 strings, a bowl back, and possibly a bent-back or crescent-shape pegbox. The Elblag instrument was carved broadly in the rebec shape with no evidence of frets and no possibility of frets, due to the very rough and uneven shape of the neck, and it is only 33.3cm long. These factors in isolation might indicate a rebec, but other factors throw up a range of insurmountable problems preventing clear identification. (i) The Elblag instrument has 4 nut grooves and 4 pegs for 4 strings. Together with the fact that it has a single sound hole in the centre of the soundboard, unknown on any rebec, it cannot be a rebec and is too small to be a vielle. (ii) Identification of this “fidel” as a bowed instrument is uncertain. Neither an indicative bridge nor a bow was found with it. This does not mean it was not bowed, just that identification as a bow or plectrum instrument cannot therefore be made. (iii) The instrument was found in Poland. As Alexander Lyczywek of the University of Gdansk laments in his study of the Elblag findings, research into musical history and instrument organology in eastern Europe is sparse. My own studies have shown that, in this case, it is due to the loss of relevant artefacts in the attempted destruction of Polish material culture by the Nazis. This, I have to conclude, is what led Polish researchers to identify the eastern koboz found in Elblag as a western gittern, an error repeated in all literature I have found on the Elblag instruments. The “fidel” may be a gudok, an eastern European bowed instrument similiar to a rebec, but its appearance in Elblag does not match gudoks played today, and I have found no research into its historical evolution, so this identification is uncertain. In conclusion, we can identify criteria for distinguishing between the sometimes visually similar rebec and one form of the vielle, but we lack any reliable criteria for identifying the Elblag instrument, or even whether it was played with a plectrum or a bow. The remnants of the two fiddles recovered from the Mary Rose, which sank in 1545. The other two surviving ‘fiddles’ are English. Ironically, they were not preserved through being in someone’s private collection, but because they sank to the bottom of the Solent – the strait between the Isle of Wight and mainland of England – on board Henry VIII’s ship, the Mary Rose, on 19th July 1545. It wasn’t until 1971 that the wreck was discovered, and not until 1978 that the initial excavation work began. Unsurprisingly, then, neither of the found instruments have survived intact; but the remains do show that they were carved from solid wood, as we would expect of a vielle. The Mary Rose vielles. Photographs by Peter Forrester, used with his kind permission. The elongated box shape with rounded edges was common for a medieval fiddle, and these examples show that this general shape continued into the mid 16th century. However, the inward curves of the four corners give these instruments an unusual outline compared with earlier fiddles and they are considerably smaller than one would expect at 12 centimetres across. This being the case, it is doubtful that the Mary Rose instruments are vielles. They are similar in proportion, though different in outline, to two instruments shown in Italian painter Cosmè Tura’s Madonna with the Child Enthroned, a panel from the Roverella Polyptych, painted in 1474. A similar instrument is shown on a table in A Concert, 1485-95, by another Italian painter, Lorenzo Costa, and a 1524 engraving by Dutch artist Lucas van Leyden shows an instrument with a very similar shape, but larger and apparently with a bowl back. Since the lute’s 4 single strings and only 4 frets in the same depiction are impossible, the accuracy of the bowed instrument is a moot point. These instruments may be related to the Mary Rose fiddles, and they may be vielles, but they may not, and positive identification is elusive. Cosmè Tura’s Madonna with the Child Enthroned, a panel from the Roverella Polyptych, 1474 (now in the National Gallery, London). Left, A Concert by Lorenzo Costa, 1485-95, and right, an engraving by Lucas van Leyden, 1524, both showing bowed instruments similar to those found on the Mary Rose. Though we have plenty of iconography for the vielle, its manner of playing needs some decoding. We have one key medieval source for its tuning, Tractatus de Musica, written in Paris in c. 1280 by Dominican friar and music theorist, Jerome of Moravia, and another source, also Parisian, from before 1361, more of which below. Tractatus de Musica was written for inexperienced church musicians, for “the friars of our orders or of another”, to help them understand and perform ecclesiastical chant. In the final short chapter, Jerome moved his attention to bowed strings and, for this reason, Jerome’s writing is very special for early music researchers, being the earliest surviving record of the construction and tuning of medieval instruments. He described the two-stringed “rubeba”, meaning either a rebab or rebec, stating that it is less important than the “viella”, the medieval fiddle. Jerome was moved to give instruction on the religious and secular use of the vielle, showing that in his day it was considered a suitable instrument for accompanying church music. Jerome described the vielle as an instrument for singers to self-accompany; for heterophony, i.e. for playing simultaneously different versions of same melody so that, for example, at one point in the tune the voice may fall but the fiddle rise, creating a brief harmony, perhaps particularly at a point where that note is not available on the fiddle due to its tuning (as we’ll soon see); and biphonic music, i.e. a melody over a drone. He wrote that the vielle “has, or should have, 5 strings.” The iconography shows that both 4 string and 5 string vielles, and some apparent vielles with 3 strings, were widespread. The first string on the 5 string fiddle is used as a bourdon in two of Jerome’s three tunings. Since there is no evidence of bourdon practice on the 3 or 4 string fiddle, perhaps Jerome considered this option, only available with 5 strings, to be integral to the instrument, his “should have 5 strings.” His three tunings mark the vielle out as very different from other European bowed instruments, then or now, and the tunings he described help us make sense of the vielle’s flat bridge. Before we turn to that, a quick note about the Guidonian hand, the theoretical range of available notes in medieval music, which will soon become important. Guido saw the need for some musical education, as some monks found the melodies of Gregorian chants difficult to memorise. So he created the hexachord, a six note scale whose note names derive from the first syllable of the first six phrases of the then-familiar hymn, Ut Queant Laxis, those syllables being ut, re, mi, fa, sol, la – which is, of course, the basis for the now-familiar eight note scale, do, re, mi, fa, so(l), la, ti, do. The hexachord was later developed into the Guidonian hand, an ingenious chart of all available notes in his system, mapped onto the hand by associating each note with a joint, fingertip or the palm. You can see an entertaining video of (an updated version of) the Guidonian hand in action by clicking on the picture below (opens in new window). Lovers of Sacred Harp music will notice a similarity. Every available note in the music theory of the 11th century, as mapped out on the Guidonian hand; and still in use in the 13th century when Jerome of Moravia described the three fiddle tunings. This range is known as ‘the whole gamut’, from the Latin gamma ut, being the Greek letter gamma, Γ, used for the lowest note, bass G, and the syllable ut, being the lowest note of a hexachord. A modern musician may notice something which appears odd about all the available notes in the medieval gamut: there are B naturals and B flats, but no other note is available either flattened or sharpened. This is not an omission, but integral to the way medieval modes worked. All modern major scales work to the same musical principles, with identical gaps between the 8 notes of the scale: so C major and D major sound the same, except that D major starts a tone higher, in this case making F into F# and C into C# to maintain the same pattern of tones and semitones in all major scales. It is not so with modes, which lacked sharps and flats, except for the occasional use of Bb, to avoid the devil’s interval, the horrible sounding tritone – three tones – between B♮ and F, especially when sung one against the other. This means that the relationship between notes for a mode starting on D (dorian) is different to a mode starting on E (phrygian). In addition, each medieval mode has a returning note which plays a key role in the melody, this note known as the tenor, tuba, dominant, repercussa, or reciting note; and each mode has its own characteristic figures or melodic clusters of notes. Add to this the fact that some modes started and ended in the same place, known as authentic modes, and others started on one note and finished on another, known as plagal modes, and we see that the medieval conception of sound was unlike ours. The gamut notes in this system were known as musica recta or musica vera, meaning right or true music. It is precisely in these terms that Jereme of Moravia described the notes on the vielle. This implies that any changed notes – flattened or sharpened from the gamut notes – were wrong, and this is just what the church taught: each mode had a particular sound and was associated with a particular mood, so changing notes would sully the nature of the mode or mood. We know that singers and musicians did change notes in performance (rather than in writing) because the church frowned upon it and called those altered notes musica ficta or musica falsa, meaning feigned or false music. Of course, what the church taught and what people actually did are two different prospects and, as we’ll soon see, Jerome of Moravia’s three vielle tunings take account of this. The three ways of tuning the vielle, according to Jerome of Moravia in his Tractatus de Musica, Paris, c. 1280. In each example, the note with the fermata (hold or pause sign) represents the bourdon, the drone string placed off the fingerboard, with the rest of the strings remaining on the fingerboard. In the second tuning, where no fermata is shown, there is no bourdon. If the actual pitches were indicated they would awkwardly straddle bass and treble clefs, so the 8 underneath the treble clef indicates that the actual pitch is an octave below that shown. In Jerome’s day we are a long way historically from fixed or standardised pitch, so the important aspect of these tunings is the relationship of the notes to each other, rather than the modern idea of absolute pitch. What sets the theoretical relationship is the note G, the lowest note of these tunings and the lowest possible theoretical note in the gamut. On modern bowed instruments, we tend to count strings from the highest to lowest sounding: Jerome works from the other side. Two of the tunings he describes are re-entrant, meaning they do not strictly follow the pitch order of high to low or, in this case, low to high. Since one string does not follow this low to high pattern, the next string has to re-enter the sequence, hence the term. Reproduction of a 5 string vielle by Owen Morse-Brown, clearly showing the placing of the bourdon. While the same gut string can be quite forgiving being tuned to different pitches and therefore at different tensions, these 3 tunings cannot be accommodated on a single instrument with the same set of strings, as no gut string can be tuned successfully to the tensions required for both G and d, or both g’ and d’. In this sense, vielle tunings are like baroque guitar tunings, in that there were three different ways of tuning that could only be effected by changing strings or having three different instruments. In the first tuning, the first string d is a bourdon, plucked or bowed open. The second string, tuned to G, can play only G, A, B, c, according to Jerome, thus assuming that the player will not move out of first position, which appears to be a universal assumption in this period. The third string is tuned to g, so plays the notes an octave above the second string: g, a, b and c’. This means the notes e and f are missing, supplied by the fourth and fifth strings at the octave above. The fourth and fifth strings are both tuned to d’ and so, Jerome states, they can play d’, e’, f’ and g’ and, with the application of the little finger, a’. This begs two related questions: In what kind of music is it permissible to have notes missing in the sequence which can only be played instead at the upper octave? And what sort of music is intended with a bourdon that can only pluck or bow a drone? Jerome implies an answer when he states that “a vielle tuned in this fashion can play all the [church] modes”. So if, as Jerome implies, this was a tuning for church music, therefore likely to be accompanying voices singing in different octaves, then it doesn’t matter if two missing notes in the sequence are transposed up an octave. Whether this tuning was used in other contexts or exclusively in a church setting is impossible to know. In his Voices & Instruments of the Middle Ages, Christopher Page makes suggestions for vielle tuning which go beyond Jerome’s statements, which he writes are on “uncertain ground”, but which do help make sense of Jerome’s intent more readily and logically: the flat bridge not only necessitates playing all strings except the bourdon at once, those adjacent strings in unison or in octaves were paired courses. On this basis, for the first tuning he proposes 3 courses: d (bourdon), G-g, d’-d’. This makes an octave between the bourdon and the highest-pitched bowed course. Played as a block of strings with a flat bridge, this would produce parallel moving octaves (octave organum) on the middle course which come and go, depending on whether this course is playing the tune or an open drone. 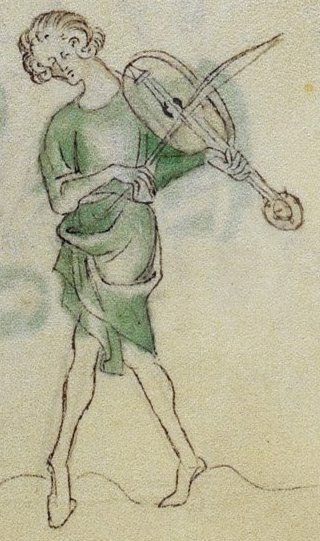 Another fiddle player in the Queen Mary Psalter, England, 1310–20, as also shown at the head of this article. Strings 1, 2, 3 and 4 are tuned the same as in the first tuning, but string 1 is on the fingerboard, i.e. there is no bourdon. String 5 is now tuned up to g’, not in unison with the fourth string. The second of Jerome’s vielle tunings is, he states, “necessary for secular and all other kinds of songs, especially irregular ones, which frequently wish to run through the whole hand.” A little decoding may be necessary: “irregular” songs are either those employing musica ficta not approved by the church, or otherwise songs that do not follow the ecclesiastical modes, hence “secular and all other kinds of songs”; and “the whole hand” is the Guidonian hand, the whole gamut, as described above. Christopher Page’s flat-bridge solution to tuning 2 is 4 courses: d, G-g, d’, g’. With the first string d freed from being a bourdon drone and the highest string now up to g’, this tuning has (almost) the whole gamut of two octaves and a sixth available (it has two octaves and a fifth, as e’’ doesn’t seem to be possible) while, assuming a flat bridge, the non-stopped strings continue to play drones. All strings are single except for the octaves on the G-g course, so it retains an element of octave organum. On this octave course, the ear would automatically pick out the octave intended for the melody and hear the other octave as parallel organum (as is also true on the octave course of, for example, the renaissance cittern, in my experience). It may be quite a shock to the modern ear to hear all of those strings being played at once as a drone block except for the one melody note being picked out. We don’t have evidence for which of these tunings were used with a curved bridge, enabling the player to select single strings, but the arrangement of pitches in this tuning, meaning that all notes are available in first position to “run through the whole hand”, makes it the best curved bridge candidate. However, if the details of the vielle in Sano di Pietro’s Madonna enthroned with baby are correct (shown above among the illustrations of bridges), showing an arced bridge and the bourdon which the second tuning lacks, then the first tuning that “can play all the [church] modes” is the best candidate for the arced bridge. It all depends on the accuracy of Sano di Pietro’s depiction, which is something we cannot corroborate. Played as 5 single strings with a curved bridge this tuning is impossibly odd. On the surviving manuscript, a commentator has written in the margin, “I do not see how note b is sounded”, and neither can I. Christopher Page does not mention, as Ephraim Segerman (2001) does, that Jerome’s contemporary Pierre de Limoges, who owned the only complete copy of the Tractatus, added a note to identify the first G as a bourdon. Jerome didn’t state what kind of music this tuning is designed for and, if Pierre de Limoges knew, he didn’t write it down. Christopher Page’s flat bridge solution for string arrangement is 3 courses as G-G, d, c’-c’, or 4 courses as G (bourdon), G, d, c’-c’. It may appear that, with the bridge completely flat, with a constant “humming block” (as C. Page evocatively calls it), it doesn’t matter if the strings are arranged singly or in courses. For the bowing hand, this is true; but for the stopping or fretting hand, it is most important, as two strings placed together in unison or in octave courses need to be placed such that they can be stopped or fretted together. Christopher Page suggests that because some notes are missing in tuning 1, playable only at the octave above, then it is conceivable to have many more missing notes in tuning 3, and not available at all, with the melody played only on course c’-c’, and with G-G and d playing only drones. Realistically, this only gives the player a range of a fifth. He cites the only surviving example of a chanson de geste melody, Audigier, dit Raimberge, which has a range of only a fourth and could therefore be played in this tuning. He argues that if we cease to think of the vielle as a melodic instrument, but as an accompanying instrument, then the tuning could work in the suggested way. He may be right, but the circumstantial evidence of a single song doesn’t seem strong grounds on which to base a whole repertoire for a tuning with such a small range. I’m going to suggest that there is a more viable and historically-attested solution for tuning 3, arrived at through comparison with crwth tuning and technique. The European bowed lyre or bowed rote was a development that emerged in AD 900–1000 from the plucked lyre, which dates back to 2000 BC. Members of the family of bowed lyres have been known by various names in various physical forms in different times and places, with various numbers of strings: crwth (Welsh), crowth, crouth, crowde (Middle English), crout (French), cruit (Gaelic), crot, cruit (Irish), chrotta, hrotta (German), talharpa, tagelharpa, stråkharpa (Scandinavia), jouhikko (Finland). Left: Crwth on the late 14th century chapter house mural, Westminster Abbey. Right: 18th century crwth housed at Saint Fagan’s National History Museum, Cardiff. Neu vi a torreis cant kaer. Neu vi aledeis cant maer. Neu vi arodeis cant llen. Neu vi aledeis cant pen. Wyf bard ac wyf telynawr. Wyf pibyd ac wyf crythawr. I am a piper, and I am a crythor [crwth player]. Of seven score musicians, the very great enchanter. Left: A (bowed?) lyre in Durham Cathedral Library, MS Hunter 100, f. 62v, 11th century, showing 2 bourdon strings. Right: A bowed lyre in De nobilitatibus, sapientiis, et prudentiis regum by English scholar, Walter de Milemete, 1326, apparently without a bourdon. On a depiction of a (bowed?) lyre of the 11th century, in Durham Cathedral Library, MS Hunter 100, f. 62v (above left), we have the first indication on a lyre of bourdon drone strings, 2 strings positioned across the bridge and then off the fingerboard which, on a bowed instrument, would be either plucked by the player’s left thumb or bowed. The evidence for the bourdon strings then becomes problematic, since this feature does not appear again in surviving evidence until the 14th century. There are two possibilities: that bourdons on lyres were in use from the 11th century continuously, but the evidence has not survived; or that the use of bourdons came and went. The first scenario would certainly be neater, but it is the second which fits the current evidence. Bowed lyres of c. 1385 onwards looked recognisably similar to the modern crwth with bourdons, such the instrument now kept at Saint Fagan’s National History Museum, Cardiff (pictured above), made by Richard Evans of Llanfihangel Bachellaeth, Caernarfonshire, in 1742. Bowing the bourdon is possible as the crwth has no pegbox and all strings are on the same plane. Bourdon bowing and plucking was still used in 1768-9 (testified by British Library Add. MS 15020:91) and until the instrument’s demise in the 19th century. Since this practice began in the 11th century and became commonplace in the mid to late 14th century, we can speculate that either the 5 string vielle with a bourdon was influenced by the crwth, or that the crwth took on a feature of the vielle. Either way, the bordon, the flat bridge and their tuning links the two instruments. For our purpose, it is the tuning of the flat-bridged crwth that is of most importance. In his A Tour Round North Wales, volume ii (London, 1804), William Bingley interviewed a crwth-player in Caernarfon, who gave a 3 course tuning of fifths doubled with octaves. In relative terms (the actual pitches may vary), he gave the tuning as A-a, e-e’, b-b’. That tuning is clearly very late for our purposes. Jerome’s vielle tunings only had one interval of a fifth: this crwth tuning, with two fifth intervals, may have been influenced by the violin, given the date. Certainly, a tuning in fifths does not sit easily on an instrument with a flat bridge. There is a tuning recorded slightly earlier, which is not possible on the same strings. British Library Add. MS 15020:91, dated 1768-9, with a copy in Wales now known as Aberystwyth MS 168:6, gives relative pitch instructions which are very clear. In relative terms, the strings are tuned: G-g, c’-c, d-d’. This tuning is accepted by researchers and players as traditional for the instrument. This cannot be proven and I’m going to need to convince you of its relevance. We are comparing two different instruments, and there is a gap of nearly 500 years between Jerome of Moravia’s description of vielle tuning in c. 1280 and the nearly identical British Library ms. description of crwth tuning in 1768-9. The available notes in Jerome’s third vielle tuning, G (bourdon) G, d, c’-c’, are G, A, B, c, d, e, f, g, a, c’, d’, e’, f’, g’. The available notes on the crwth in the similar tuning, G-g (bourdon), c’-c, d-d’, are almost identical. The only differences are the availability of A and B on the vielle but not the crwth, and the addition of a’ on the crwth. The anonymous commentator wrote in the margin of Jerome’s manuscript for his third vielle tuning, “I do not see how note b is sounded”. In crwth tuning, the same is true. To make the point clear, there follows two almost identical paragraphs on actual crwth technique and my imputed vielle technique in the third tuning, with some words in bold for ease of comparison. Crwth. With the melody played on the flat-bridged crwth on the d-d’ course, we have a G-g c’-c drone. Thinking in modern terms, we could say this is nominally a modern C chord (without a third). Playing the melody on the c’-c course gives a G-g d-d’ drone, so nominally a modern G chord (without a third). This means, in modern terms, we have practical drones for I and V in nominal C, or drones for I and IV in nominal G, constantly available. This changing accompanying drone is established crwth technique. Vielle. With the melody played on the flat-bridged vielle in the third tuning on string d, we have a G c’-c’ drone. Thinking in modern terms, we could say this is nominally a C chord (without a third). Playing the melody on the c’-c’ course gives a G d drone, so nominally a modern G chord (without a third). This means, in modern terms, we have practical drones for I and V in nominal C, or drones for I and IV in nominal G, constantly available. This suggests that a changing accompanying drone was vielle technique in the third tuning. The string spacing on the crwth is such that gaps between strings of a course are smaller than between courses, as one would expect, enough to identify each pair of strings. At the same time, the gaps between the two strings of a course are still enough that a player can easily chose to split the course, to stop one or the other octave of a course, or stop both together. Much of the iconography of the medieval fiddle appears to show equal string spacing: I suggest the possibility that this is because double-strung courses had string spacing that looked equal to a non-player, or from only a short distance, which enabled the vielle player to split a course when required, as on the crwth. So both the 5 string vielle and the crwth employ a bourdon off the fingerboard; a flat bridge to effect a block of strings played as a drone; both use strings in courses tuned in octaves but with a wide string spacing within the course; and Jerome’s third vielle tuning is, for all practical purposes, virtually identical to traditional crwth tuning. I suggest that there are no significant differences in playing technique between the two instruments. So what looked like an unpromising vielle tuning has a playable range of two octaves, with only the note b missing, which is available at the lower octave if we work on the same principle as tuning 1, that missing notes in one octave can be played in another. In practice, this can clearly only be achieved if the whole phrase with b in it is played at the lower octave. In any case, the missing note b could simply give rise to a moment’s heterophony. If, for example, the fiddle is tracking the vocal melody for a tune that goes from c’ to b (for example), the player could simply have a moment’s harmony and play c’ to d’. The player may not be tracking the vocal melody at all, in which case the problem goes away. It is tempting to suggest that these two instruments are so closely related that it cannot be a coincidence. It may be that the vielle was a development of the crwth, just as the crwth was a development of the lyre. Both crwth and vielle use tunings designed around open strings g, c and d in different octaves, and both bring out an alternative drone when a different course is used to play the melody. The drones available for crwth and vielle are functionally identical. A detail and then the whole of Pluto and Persephone enthroned, from Le livre des échecs amoureux moralisés (The book of chess lovers moralised), a late 15th century manuscript by Evrart de Conty, illuminated by Robinet Testard, now in the Bibliotheque Nationale, Paris (BNF Fr 143). In the background and right we have harpers; but what is the instrument being held in the left corner? It is usually identified as a rebec but clearly it is not: it has four strings; a wide body making the playing of individual strings impossible; and therefore of necessity a flat bridge. Its body shape has both crwth and vielle characteristics. Certainty is impossible, but it is tempting to link the 3 styles of bridges to the 3 tunings. It seems sensible to suggest that tunings 1 and 3 required a flat bridge, while tuning 2 was played with a curved bridge; or that all tunings could be played with a flat bridge, but only tuning 2 could be played with a curved bridge. Now let’s turn to another gap in the historical record, and see if we can reach viable and justifiable answers. Above we discussed that Jerome of Moravia stated that the vielle “has, or should have, 5 strings.” What this means is open to interpretation. It appears to indicate that some vielles had fewer than 5 strings, but Jerome didn’t think much of them. 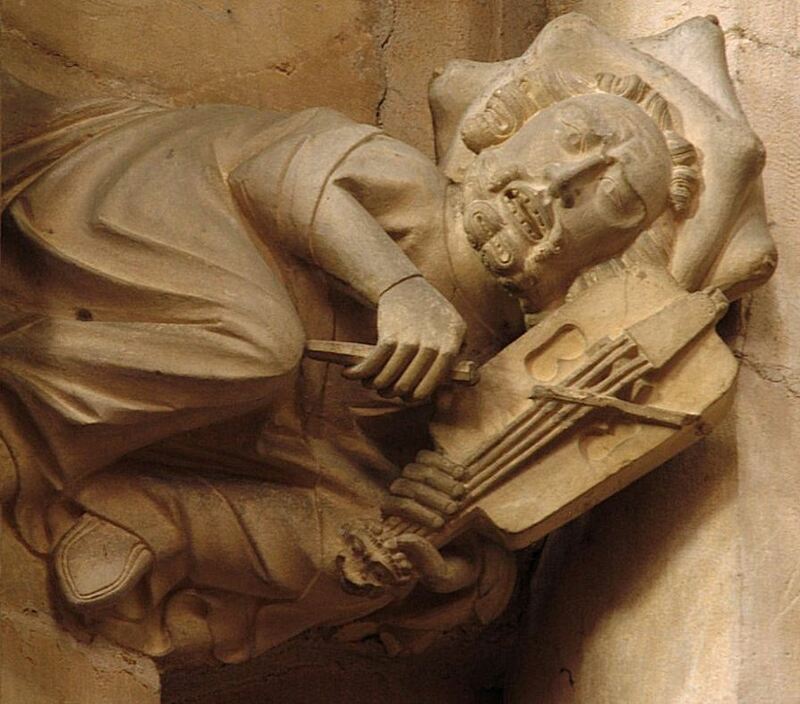 Certainly, there were instruments that appear visually to be vielles with fewer strings, such as that carved in Beverley Minster, c. 1335-50, seen below, which clearly shows 4 strings in 2 paired courses. The following discussion makes the assumption that instruments with fewer than 5 strings which appear to be vielles were indeed vielles. Though evidence is lacking, it seems sensible to suggest, on the basis that 4 string fiddles did not have a bourdon, that they were tuned as 5 string fiddles but without the potential bourdon string, what Jerome calls the first string. This, I suggest, is the reason Jerome gives no tunings for 4 or 3 string fiddles, since they “should have” 5 strings, i.e. they “should have” the possibility of a bourdon. 4 string fiddle and fiddler carved in Beverley Minster, c. 1335-50, clearly showing a flat bridge and a 2 course arrangement of strings. This instrument also has a carved head instead of a peg board, almost certainly a restorer’s mistake during the work of the late 19th and early 20th century. Since there are no visible pegs and no way of getting to any hidden pegs, this instrument would be untuneable as presented. In this case, Jerome’s first tuning – d (bourdon), G-g, d’-d’ – with 4 strings becomes G-g, d’-d’. It now becomes obvious that this tuning on 4 strings comprises an octave course and a unison course, in line with both Christopher Page’s suggestions and crwth practice of doubling bowed strings in octaves. So it is most intriguing that the carving of a 4 string fiddle in Beverley Minster, Yorkshire, England, dated to c. 1335, suggests exactly this arrangement, with a wider gap between the middle strings than between the first two and second two strings, and with a flat bridge. The notes e and f were already missing in this tuning: without the re-entrant d string, d is also lost, available, like the previously lost notes, an octave higher. It would also be possible to have this as a 3 string fiddle tuning in 2 courses without losing any range, simply by not doubling the d’ string, i.e. G-g, d’. Jerome’s second tuning – d, G-g, d’, g’ – lacks a bourdon, giving more potential options for which string to miss. If we work on the principle that the re-entrant first string is always the addition when moving from a 4 string to a 5 string vielle, then tuning 2 becomes a 3 course arrangement of an octave pair and 2 single strings, G-g, d’, g’, effectively a repeat of the first tuning on 4 strings but with an extended upper range. Without the re-entrant d string, the effect is to lose the notes d, e and f, still available an octave higher. A 3 string fiddle tuning then suggests itself without the lower octave G, 3 single strings, g, d’, g’. 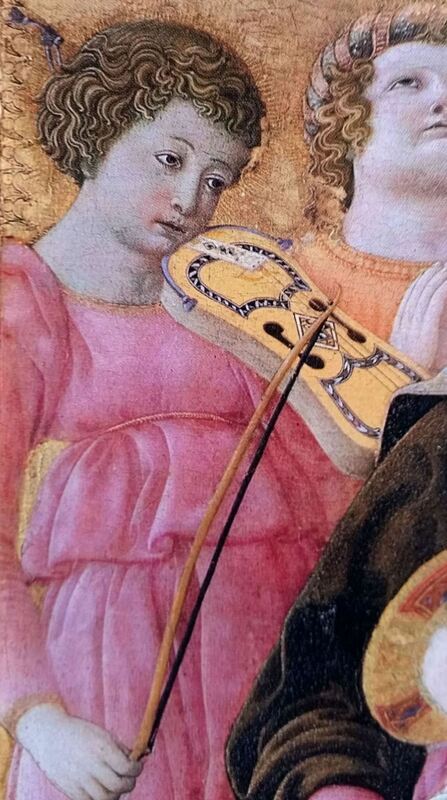 An apparent 3 string vielle in a detail from Domenico di Bartolo’s painting, Madonna of Humility, Italy, 1433. Jerome’s third tuning – G (bourdon), G, d, c’-c’ – also leads us to possibilities for both the 4 string and 3 string vielles: 4 strings would become G, d, c’-c’ in 3 courses, doubling the top c’; with the 3 string fiddle having a single c’. If these suggestions are correct, then the removal of the first string removes the bourdon and thereby removes re-entrant tuning on the 4 and 3 string vielle; and all tunings with 5 strings are available on 4 and 3 strings, but with a loss of range, as one would expect when reducing string numbers. That is one solution. Another is to miss out the second string. It could be argued that this is a more logical step for the 4 string fiddle. When the lute, over the course of its evolution, gained a wider range of pitch, it was generally the bottom end that was added. The vielle appeared in the 11th century and Jerome was writing in the 13th, so if the same is true of the vielle as of the lute, then it could be that the 5 string instrument evolved from the 4 string when the low G was added in order to achieve the whole gamut. Removing the low G would make 4 string tuning 1 into d, g, d’-d’ in 4 courses, with an option for the 3 string fiddle of a single d’. Tuning 2 would become d, g, d’, g’, of necessity 4 single strings. On this method, tuning 3 would be impossible with only 3 strings: both low Gs would have to be removed, making a 4 string tuning impossible, and 3 string tuning would have 2 impractical courses, d, c’-c’. The second theoretical solution undermines the proposed close relationship between the crwth and the vielle, which necessitates the low G. The first solution for 4 and 3 string vielle tunings retains the integrity of Jerome’s 3 tunings; the integrity of what the evidence suggests about vielle drone playing styles; and the implications of crwth playing style for the fiddle. For the modern player who wishes to stay with 4 single strings rather than strings doubled into courses, a combination of Jerome’s essential open strings d and g is immediately user-friendly and retains the historical drone characteristic. On the basis that it is the relationship between pitches that is important rather than absolute pitch, and that players will have voice pitches and other accompanying instruments to match, musicians always need to make their own creative adaptations. Helen Wilding, fiddler with medieval trio Fleurs de Lys, utilises just such an adaptation for her melody-in-drone playing to suit bagpipes and hurdy gurdy: G, d, g, d’. Illustration showing tuning from the Berkeley MS, before 1361. Up to 80 years or so after Jerome of Moravia’s treatise, we have a quite different tuning in the Berkeley Theory Manuscript. The author is uncertain, but Christopher Page has presented strong circumstantial evidence for it being Johannes Vaillant, a 14th century Parisian music teacher, who died in 1361. This puzzlingly neglected source shows a tuning of c d g c’, a tone followed by two fourths, without a bourdon and without Jerome’s re-entrant tuning. There is some doubt about the instrument’s identity. Christopher Page works on the assumption that it is a vielle and, as such, comments that the illustration is curious: a frontal string-holder replaces the usual tail-piece; and peg boxes, such as those on gitterns and citterns, are often decorated with carved heads or other ornamentation, but to have a carving on a peg board appears to be unique to this source (except the erroneously restored Beverley Minster vielle – see photo above). It may be that the author was drawing a highly unusual individual instrument, but this seems unlikely since the purpose of his text was to describe common practice. More likely is that this isn’t a fiddle, but a citole. While the instrument is in one of the shapes used for the vielle, it is also in one of the shapes used for the citole and, if it is such, the decorated peg box is not unusual. The frontal string-holder is still problematic, appearing to be a tail-piece morphed into the shape of a fixed bridge. The artist may have been confused but, as we see below, though vielles and citoles often shared the same tail-piece string-holder arrangement, citoles did sometimes have other ways of affixing strings not seen on fiddles. The Berkeley instrument is fretless. While fiddles were often fretless and citoles were always fretted, the lack of frets does not preclude this being a citole, since all of the Berkeley illustrations are incomplete, including an apparently fretless gittern on the same page and a harp with only 4 strings. The author drew just enough to make his point. Still, if this is a vielle, it is curious that the author did not draw a bow or mention one in the text. The name given to the instrument in the text is cithara, which is where the problem arises. Music theorists of the medieval and renaissance periods loved to give instruments antique names, to link them to ancient practice. Thus the cithara, from the Greek kithára (κιθάρα), the Assyrian chetarah, and from the Latin cithara – a lyre for which there is evidence dating back to 1700 B. C. – was the same name used indiscriminately by many writers for lyres, harps, psalteries and, indeed, it sometimes seems, for almost any instrument, open-stringed or fretted. The cithara in Berkeley is a case in point, a word by then more associated with the citole than the vielle. What muddies the waters is that ancient Greek comic playwright, Aristophanes, gave the first recorded version of the word for fiddle – but not to describe a fiddle. The Latin fidiculae (fidēs = chord +‎ culae = diminutive suffix) in his play of 405 BC, Ranae (The Frogs), described a kind of cithara or lyre. The Latin fidiculae gave rise to associated words for both bowed fiddles and plucked vihuelas: the German fidula and videle, the French vielle and viole, the Italian viola and violino, the Spanish viguela and vihuela, the English fithele and fidel, and so on. It can be frustrating and confusing, and that is why, to be certain of a medieval instrument’s identity in a written description where that name has several meanings, it is necessary to corroborate with its historical or social context, physical description or an illustration – and they are not always available or conclusive. Certainty is impossible, but my conclusion is that the Berkeley cithara is a citole. If so, this means we don’t have an additional tuning for the vielle, but we do have the only surviving tuning for the citole. 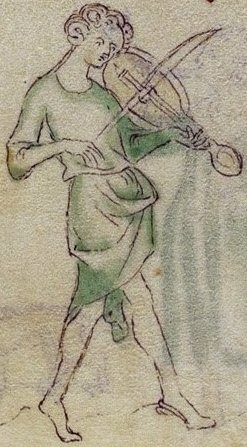 Evidence is lacking about fiddle tunings from its early life in the 11th century. Since there were 3 known tunings in France in c. 1280, we can legitimately ask if they were tuned the same way contemporaneously in France, Spain, Italy, Germany, and England, and if tunings changed over time. I suggest a general answer can be reached with a degree of certainty though, without corroborating evidence, a definitive answer is impossible. The structure and tuning of the flat-bridge medieval fiddle suggests that it should not be thought of in the same musical category or soundworld as later bowed curved-bridge instruments such as the viola da gamba and violin, which generally function to play a single-line melody, sometimes with adjacent-string harmonies. Rather, the vielle should be associated with the family of instruments which function as a melody played over or within a continuous drone, as with the crwth. Characterised in this way, there is a group of instruments which, like the vielle, was used in church music: the family which evolved from organistrum to simfony to vielle à roue (hurdy gurdy). From the 10th century we have evidence of the organistrum, a large instrument played by two people, one to turn the crank for the rosined wheel which acted like a continuous bow against the two drone strings and single melody string, and one to move the sliders, requiring two hands, which produced notes by shortening the vibrating string length of the melody string over the drones. By the 13th century, a smaller, one person version had been developed, the simfony (simphonie, symphonia, etc. ), with tangents instead of sliders, usually underneath the instrument; and by c. 1500 this had evolved further into the vielle à roue, literally the wheel fiddle, with its rhythmically buzzing bridge, which became known in later times as the hurdy gurdy (from 1749, according to the Oxford English Dictionary). At all stages of this instrument’s evolution, the drone is fundamental to its sound. I suggest that this naming is significant. Indeed, it seems sensible to assume that the wheel fiddle, the vielle à roue, gained its name, not just from the wheel acting like a continuous fiddle bow, but also that, and even primarily that, the drone strings of the vielle à roue effected the same soundworld as the vielle. Certainly, Jerome’s 13th century drone tunings produce a style of music suited to the 12th and 13th century including, he tells us, sacred music, and the emergence of the vielle à roue in c. 1500 suggests that this style was still played on the vielle then. So, while we can’t say for certain that the exact tunings Jerome gives were used since its emergence (from the crwth? ), we can suggest at the very least that the drone principles upon which his fiddle tunings were based remained a constant feature. The hurdy gurdy family, left to right: organistrum, from a stone portal at Santiago de Compostela, Spain, dated 1188 (from a plaster cast of it in the Victoria and Albert Museum); a pair of simfonies, from the Spanish/Portuguese song book, Cantigas de Santa Maria, 1260–80; and the first known depiction of a vielle à roue with a buzzing bridge, from Hieronymus Bosch, The Garden of Earthly Delights, Netherlands, c. 1500. The tunings explored so far cover most of the life of the vielle, but it is not the complete story. In the 15th century, at the beginning of the renaissance, musical norms were rapidly changing. The vielle was still being played, but was past its dominance of musical culture. The discarding of the quill by lute players, spreading gradually from the 1470s to the 1490s, meant that a single player could produce solo polyphony with individually moving fingers, and this was the dawn of the lute’s dominance of renaissance music. The musical shift which led to this advance led in turn to divergence of practice among fiddlers and some structural changes to the instrument. 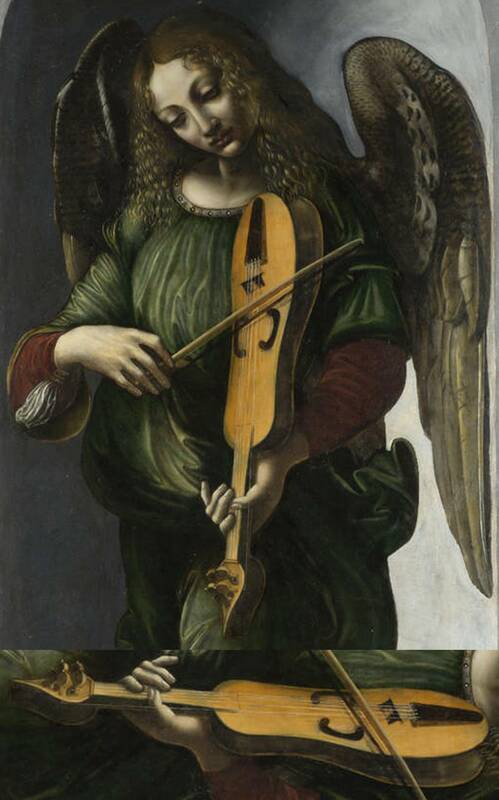 While the vielle played by the angel in green from the Immaculate Conception Altarpiece (pictured above), painted 1490–99, shows that old practices continued, others innovated, increasing the height of the bridge and normalising its arc such that each string could be individually bowed, thus enabling these fiddlers to play polyphony with others without having to play drones. It was during this century of change that the gittern and the lute changed tunings: did vielle tunings change, too? To answer this question we have to turn to the only renaissance witness in the matter, Johannes Tinctoris (c. 1435–1511), a Belgian composer and music theorist who lived most of his life in Italy from c. 1472. Tinctoris stated that the 3 string fiddle was tuned in fifths, which is the same tuning as the rebec, and he may have meant the rebec. The 5 string fiddle, stated Tinctoris, had an arced bridge to facilitate the bowing of individual strings, and was tuned “unevenly in fifths and unisons”. What this means precisely he didn’t state, but Jerome’s first tuning can be seen to fit this description: d (bourdon), G-g, d’-d’ has “fifths and unisons”, and the re-entrant tuning and the G-g octave course makes the pitch distribution “uneven”. So it may have been that this tuning continued to the 15th century, except now without the ability to play a drone block with all strings at once, as the bridge was now arced. 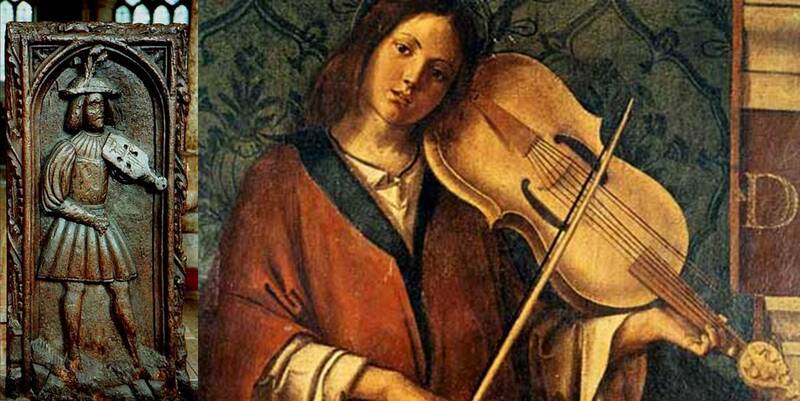 What of the 4 string fiddle in the early renaissance? Ephraim Segerman states that the “only historical evidence on the tuning of 4 string fiddles is the occasional 15th century picture that shows a string thickness sequence of thickest, thinner, somewhat thicker and thinnest, seeming to imply two octave pairs a fifth apart.” If these depictions of string thicknesses are an accurate reflection of practice – and that’s a crucial and unanswerable question – then this 15th century arrangement doesn’t precisely fit any of my 4 string suggestions above, but it is close to my 4 string modification of Jerome’s first tuning: G-g, d’-d’. To comply with Ephraim Segerman’s observation, all we need do is make the top course octaves rather than unisons: G-g, d-d’, which reflects crwth practice of courses in octave pairs. The challenges to the vielle from the changing musical styles of the renaissance spelled its gradual decline, but not before it had inspired the birth of another instrument towards the end of the 15th century, whose lifespan overlapped the demise of the vielle in the middle of the 16th century. The lira (or lyra) da braccio (meaning bowed instrument on the arm) was to be short lived, appearing in paintings, mostly Italian, from c. 1490 to the early 17th century, leaving behind only a short section of music added to the Italian Pesaro lute manuscript (lute music c. 1490–1511) in 1540–45. The lira da braccio music in the Pesaro manuscript is for 6 strings in 4 courses – D-d (bourdon), G-g, d, a. 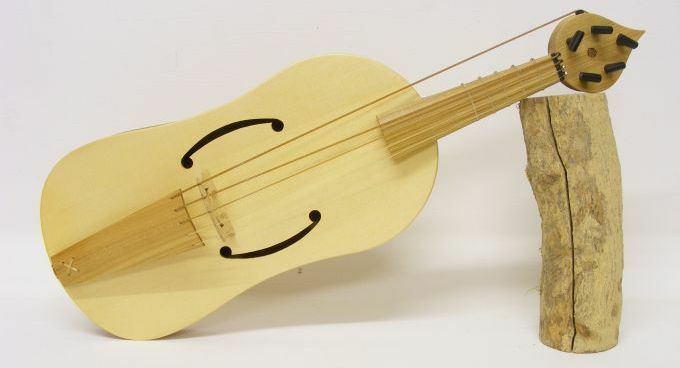 This looks exactly like a version of Jerome’s first vielle tuning – d (bourdon drone), G-g, d’-d’ – with an extra string to increase the range upwards. Other witnesses for the lira da braccio give 7 strings in 5 courses: Giovanni Maria Lanfranco, Scintille di musica, Italy, 1533, has the same tuning as Pesaro but with an additional e’, once more extending the range; and Michael Praetorius, Syntagma Musicum III: Termini musici, Germany, 1619, reproduces this but with a top string of d’. Such a close similarity between lira da braccio and vielle tuning is the strongest justification for reading Jerome’s vielle string pitches as arrangements of courses. The lira da braccio shared many features of the vielle, but was different enough to accommodate renaissance music: its neck was usually unfretted but occasionally fretted; it had 6 or 7 strings, arranged in a combination of octave courses and single strings; with 2 strings as a bourdon in an octave course; it had a wide fingerboard and a bridge with a gentle enough arc to play triple and quadruple stops (3 or 4 strings at once) chordally, rather than as a drone, due its tuning. Root and short-lived branch. Left: A 3 string vielle towards the end of its days, carved by Robert Daye, 1510-1530, on a bench end in Altarnun, Cornwall. Right: A lira da braccio player, detail from Bartolomeo Montagna, Madonna enthroned with Saints, in Pinacoteca di Brera (Brera Art Gallery), Milan, painted in 1500, towards the beginning of the instrument’s relatively short life. So we see how the lira da braccio succeeded, for a brief time, in overcoming the melody-in-a-drone strength of the vielle in the medieval period which had become its outmoded weakness in the renaissance, with the typical flat-bridged humming block replaced by the gently curved bridge tuned in fifths, enabling melodic and a degree of harmonic playing. This difference is illustrated in the final two videos: Igor Pomykalo demonstrating first the vielle, then the lira da braccio. Bevil, J. Marshall (1973) The Welsh Crwth, Its History, and Its Genealogy. Brown, Howard Mayer (1989) ‘The trecento fiddle and its bridges’, in Early Music, vol. 17, no. 3, August 1989. Davies, Emyr (2012) A new discovery within an old instrument: was the Welsh crwth unique in possessing two soundboxes? Green, Corey (2012) A Player’s Introductory Guide to the Medieval Vielle, a thesis in musicology submitted to Texas Tech University. Greenhill, Peter (2000) The Robert ap Huw Manuscript: An Exploration of its Possible Solutions – 3 tuning. Jones, Mary (2018) Celtic Literature Collective: Llyfr Taliesin – The Book of Taliesin – Peniarth MS 2. Jones, Sterling Scott (1995) The Lira Da Braccio (Indiana: Indiana University Press). Meurig, Cass (2009) Talharpa 2009 DVD, Walesi Crwthi tutvustus, on the ViljandiFolk YouTube channel. Page, Christopher (1980) Fourteenth-Century Instruments and Tunings: A Treatise by Jean Vaillant? (Berkeley, MS 744) in The Galpin Society Journal 33, March 1980. Page, Christopher (1987) Voices & Instruments of the Middle Ages. Instrumental practice and songs in France 1100-1300 (London: J. M. Dent). Pearce, Barry (2016) Bowed Strings Iconography Project. Poplawska, Dorota & Czechak, Tadeuz (2002) ‘The Tuning and Playing of a Medieval Gittern and Fiddle from Elblag, Poland’, in The Consort, vol. 58, Summer 2002. The Dolmetsch Foundation. Segerman, Ephraim (2001) ‘Tuning and Stringing Medieval Fiddles’, in FoMRHI Quarterly, No. 105, October 2001. Fellowship of Makers and Researchers of Historical Instruments. Skeaping, Joe (2001) ‘Jerome of Moravia and the Tractatus de musica’, in FoMRHI Quarterly, No. 105, October 2001. Fellowship of Makers and Researchers of Historical Instruments. Smith, Douglas Alton (2002) A History of the Lute from Antiquity to the Renaissance (The Lute Society of America). Springfels, Mary (2000) ‘The Vielle After 1300’, in Ross W. Duffin (editor), A Performer’s Guide to Medieval Music (Bloomington: Indiana University Press). van der Werf, Hendrik (1988) ‘The “Not-so-precisely Measured” Music of the Middle Ages’, in Performance Practice Review, Vol. 1, No. 1, Article 5. As a relatively new performer on vielle,I found this article to be very thorough and thought-provoking. I was half-way through when the site went down for a while – so glad it’s back! The comparison to the crwth is especially interesting to me. I’m looking forward to exploring more of your articles. It seems that modern performers on vielle, myself included, are pretty resistent to playing with a flat bridge. Droning is great, but droning on all strings all the time is challenging to us – we want to create more variation in our sound. Perhaps, though, even with a flat bridge one could choose to play just the top or top two strings, and the same on the bottom, through bow angle, at least on a wasted instrument. It seems to me that the waste, when part of the design, could be there to facilitate this. I notice that even the videos you have selected feature droning on selective strings and a curved bridge. I’m aware of only one performer – Linda Marie Zaerr – who plays on a flat-bridged instrument. Could you direct me to others? I’d like to hear more of this sound, and consider acquiring an instrument built that way. Thank you very much, Ben (and apologies for the few days of outage – took a while to get the site back online for technical reasons now resolved). I don’t know anyone else who has made the connection with the crwth. It was one of those lightbulb moments that just came to me. I contacted Christopher Page, who said he’d not made the connection and hadn’t heard it mentioned before. 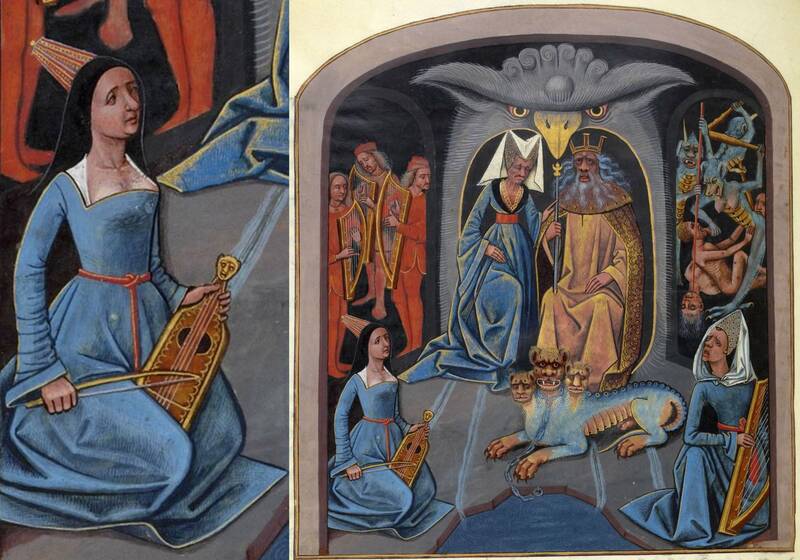 Jerome’s third vielle tuning and the flat bridge make the crwth connection quite obvious, it seems to me, and the ‘Pluto and Persephone enthroned’ painting I include above just seems to confirm it. Yes, modern vielle performers and luthiers seem not to want to play with and make flat bridges – or are unaware of them. It wouldn’t take much to replace a bridge, but I expect the majority of players were violinists first and so are used to the curve. The iconography above shows there were curved vielle bridges – and I wonder if it was associated with the second of the three tunings – but the iconography also suggests flat bridges were in the majority. I also expect that the mindset today is that the vielle is like a violin but, as I propose above, the evidence suggests that the vielle was more like (what we now call) a hurdy gurdy. I remember when I first started played lute, strung in octaves from the 4th course down, meaning that on runs in the middle of the instrument I’d keep hearing sudden octave leaps. It was very disconcerting until I learned how to play the lute in its own specific idiom, and use the lute to do what the lute does, rather than having preconceptions about what I should be hearing. I see my lute pupils go through the same experience, and I expect it’s common to all players of modern instruments who ‘go early’ and have to get used to a different soundworld. I feel very strongly that we should go where the evidence takes us and use that to remould our playing and retune our ears. The videos above have droning on selective strings and a curved bridge because I didn’t know of any fiddlers who use a historical flat bridge. I’m therefore grateful to you for mentioning Linda Marie Zaerr, and will add one of her videos into the article. If you do have a flat-bridged vielle made, I’d love to hear of your progress. Thanks for a comprehensive look at the medieval fiddle. Fascinating. I´m in shock after reading your post, because I do every thing wrong!! I´m singer of early music and recently I dare to try to accompany myself with a vielle of 5 strings copied fron “Pórtico da Gloria” of Santiago de Compostela´s Cathedral. I looked for tunning in traditional bowed instruments of northwest of Iberian Peninsula (rabel leonés and rabeca chuleira of Portugal). Nowadays I think that rabel comes from arab rebab and rabeca is very influenced by the violin… (first mistake), but the way of playing and singing, specially in brazilien rabequeiros is very interesting. I have discovered Jerome of Moravie and I read (in medieval latin) the last chapter. I understood the words, but the meaning… and finally I´ve stumbled upon your post. The analise is so rigorous and the comparison with the crwth is so credible, that I believe again in medieval music!!. I have heard all your suggestions, and another (north bowed lyra), and found even iconography who gives you the reason in double strings. I never realise that the stone instrument, prototype of mine, has clearly double course strings and flat bridge too!! My vision of medieval music is very vocal, perhaps because I´m singer, but what I see is the great symphonic orchestre of 13 century, other, in best cases, between 5 and 7 instruments agaist the singer. And public loves to see a lot of strange violins and guitares. If there aren´t, this is not medieval music. The voice is least important. That is because I love your idea of an instrument who does a sound mattres to hold the voice. Ok. Now I must to try with the new tunning and flat bridge. That´s starting again, but that´s very exciting, as restoring music. María, thank you so much for your post, which is a delight to read. Yes, so much medieval music has been played with modern assumptions, and reproductions of medieval instruments made with modern assumptions, including the vielle. It’s so important, I think, to try and sweep that away and let the music and the instruments teach us what we need to know. Though I’m sorry you’re “in shock”(! ), I am so pleased that the article has caused you to “believe again in medieval music”. Wow. What a privilge to read that. Soon I will publish the last 2 articles on the Cantigas, the last of which features the vielle played by Kathryn Wheeler, played with a bridge that has only a slight curve (as explained above). This bridge makes playing single strings very difficult (not quite impossible, but it’s a great effort), and makes droning on adjacent courses very natural. Following that will be an article, again featuring the vielle, which may interest you: ‘Performing medieval music: turning monophony into polyphony. Part 1: instrumentation and harmony’. This article uses polyphonic music as a model for ideas of how to accompany medieval monophonic music, including methods of droning on vielle. I wish you all the very best in your music-making. Thank you again for posting. Well, the shock is over. I must get to work!! And I have a lot of desire. I wait impaciently your “performing medieval music”, and start to read others articles with promising titles. I have search for Kathryn Wheeler and Linda Marie Zaerr in youtube and I found nothing. I have just updated the article above with a little more on the variety of bowed lyres and two more crwth pictures. Hello, Olov, and thank you for writing. The “Violinista” you mention is intriguing. Do you know the date of the drawing? I’ve previously not seen evidence of the lyra da braccio beyond the early 17th century, but of course evidence can always be added to. I wonder if this is a one-off, an anomaly, someone playing an inherited family instrument, or a sign of its continuation in pockets of Italy. Similar images of a similar date would help us answer that, if there are any. I’ve tried to find the image without success. Is it available online? If there is film of you playing your lyra I’d love to see it. Very informative. I’m currently building a vielle. One of my main problems is the internal bracing of the top. With so few remaining vielles from antiquity, there aren’t enough to derive generalities. Unfortunately, paintings never show the inside, which one would expect. I would like to see paintings of luthiers building them, but, of course, that’s not what the artists were interested in. To my knowledge, there are no surviving vielles (depending on what we think the Mary Rose instruments are, but they’re certainly not medieval). Not being a luthier myself, I wouldn’t like to speculate on what modern vielle makers base their detailed plans, but it would be easy enough to contact Owen Morse-Brown, for example, and ask him. Great, sympathetic and extended article on the Vielle. Thank you for recording this information and making it publicly available.